If you’re looking for the best infrared grills, then you’re in the right place! Allowing you to cook inside by eliminating the hassles of smoke and ash, infrared grills give you the option of healthy, freshly grilled and seared meat and veggies all year long. What’s better than that? We had our experts research and review more than twenty models to bring you a top ten list, so you can find the best value infrared grill to suit your cooking needs. Before you get started, check out some specifications to keep in mind. Portable: Some units will be portable, so you can move them around your home or even bring them to a friend’s to share the grilling fun! Check this spec to determine if the model you like is moveable. Type: Heating food with an infrared element requires a power source. We’ll let you know here what type of grill you’re looking at, whether it’s gas, electric, or another design. Smokeless: A smokeless grill opens up the world of indoor grilling. When the design is smoke-free, you can enjoy grilled foods at your leisure from the comfort of your kitchen, regardless of the weather outside. Material: Whatever your preference is--stainless steel, plastic, or other materials-- we will let you know the look and feel of the grill with this spec, so you can pick the perfect match for your living space. Size: Depending on where you plan to use and store your grill, you’ll want to be clear about its dimensions. Make sure you find the right fit, by checking out this spec. Warranty: Who doesn’t love a guarantee? When you make an investment, you want to know it’s covered. Check this spec for info on the warranty and how long it lasts. Now that you know what to look for while shopping, you’re ready to pick the top infrared grill to suit your needs. Are you ready to enjoy delicious, perfectly cooked cuisine, without all the hassle of a traditional grill? We hope so because we’ve got a list of ten excellent, quality options just for you! If you’re in a hurry, check out our top and budget picks first! 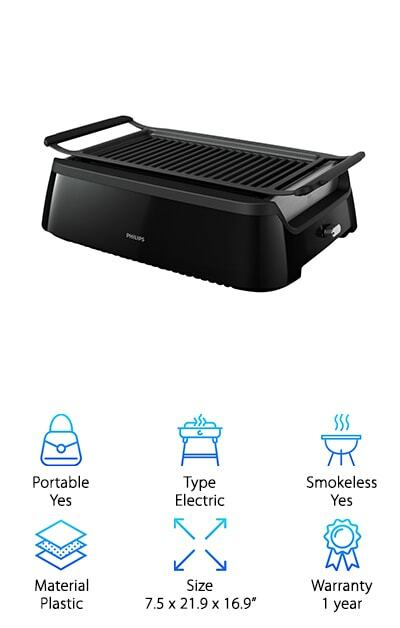 Bring the party inside, with the Philips Smokeless Indoor Grill. Advanced infrared technology and special reflectors cut out the middleman of fire, to bring maximum heat to your food. 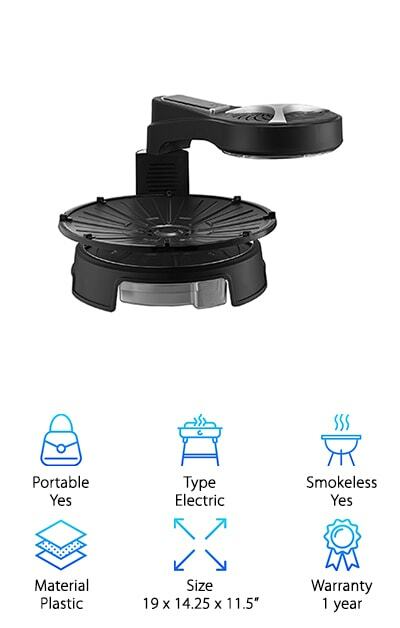 You no longer have to deal with the hassle of smoke or fuel, thanks to this awesome design, which heats up to the perfect temperature of 446 degrees Fahrenheit for optimal seared, juicy meat. In just six minutes, the Philips is ready to cook all your favorites with the help of a little indoor electricity. A drip tray underneath catches all the trimmings and juices, making clean up a breeze. Even better, you can put the grid in the dishwasher! Never has enjoying a steak been so easy! without the hassle of smoke or fuel. Advanced infrared technology and special reflectors guide heat to the grid for delicious, evenly grilled food. The drip tray underneath remains cool so there is virtually no smoke. If you’re looking for the best infrared grill on the market, you found it! If you want the best tru infrared grill, you can have it at a price that won’t break the bank! The Big Easy by Char-Broil gives you the option to smoke, roast, or grill all in one convenient model! The tru infrared technology cooks food to perfection, so you can enjoy all your favorite meats just the way you like them-- juicy and delicious! Capable of holding up to 25 lbs for roasting, the roasting basket cooks turkey, ribs, and other meats evenly. 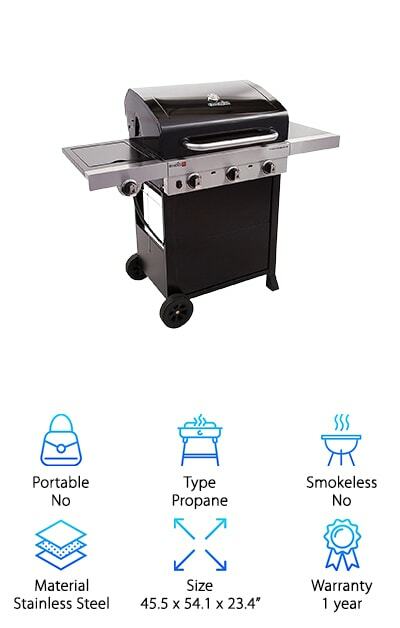 Enjoy 180 square inches of grilling area, allowing you to cook several items at a time. And don’t forget to use the smoker box for additional, unmistakable flavor! An attractive porcelain hood keeps food enclosed and protected, while cool touch handles let you open and close with ease. Fueled by propane, this model does it all and requires minimal clean-up. It’s the perfect addition for your outdoor set-up! You want the best infrared grill, and you want it to be capable of cooking for the whole family and then some. If you need a full-sized grill with all the benefits, including infrared technology, you’re in luck! Royal Gourmet delivers a six-burner, two-hooded option large enough to cook for your family and your guests. 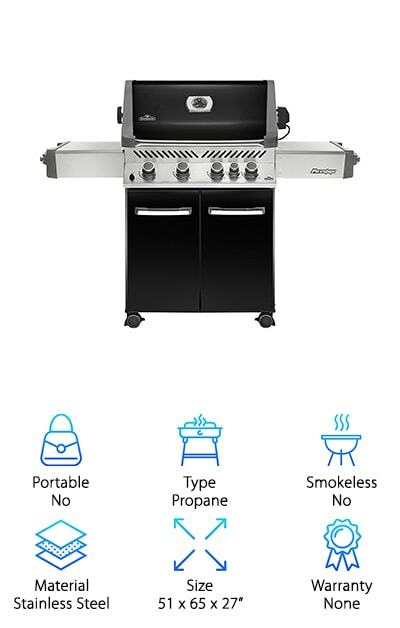 Fueled by propane, this grill offers 697 square inches of primary cooking area and a warming rack that provides a secondary cooking area with 265 square inches. The cooking grate is porcelain and cast-iron, designed to keep and enhance meat’s natural flavor. A stainless steel tube burner, brass side burner, and an infrared rear burner put out 96,000 BTUs of heat. And take advantage of the ample storage space underneath the burners! If you’re in the market for top performance with the benefits of infrared, look no further, because the Royal Gourmet has it all. It doesn’t matter how many you’re cooking for, everyone deserves to enjoy delicious, perfectly even and succulent treats from the grill! If you’re seeking out the best small infrared grill, then check out the Solaire. 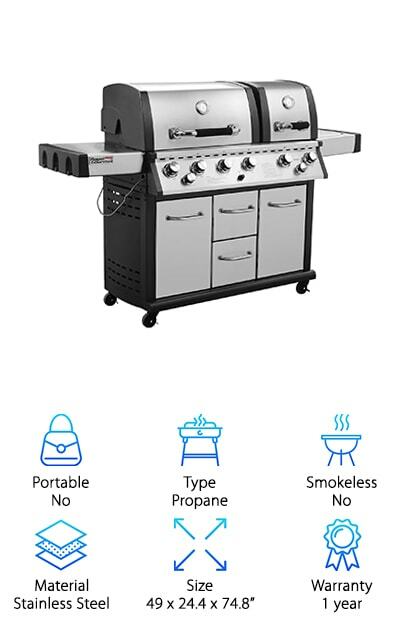 Equipped with a real infrared ceramic and stainless steel burner and 140 square inches of grilling space, you can cook up to six burgers at a time or a lavish feast for two! The v-grate design ensures excellent flavor and eliminates the chance of flare-ups. 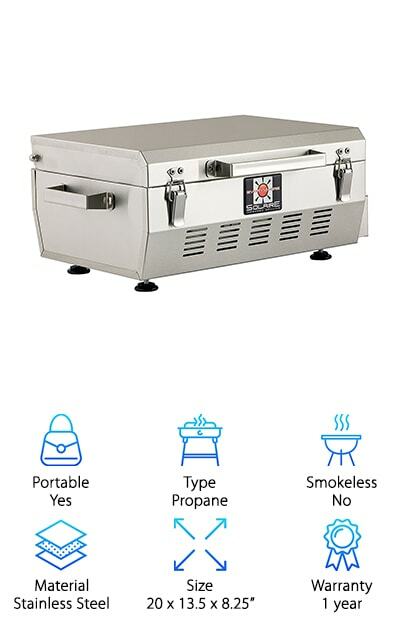 An electronic push-button ignition provides an easy start and shut off, so you know when the grill is on and hot and when it’s off for sure, reducing the chances of getting a burn. At approximately 15 lbs and featuring a smooth, stainless steel cover, you can bring this grill with you or easily store it in your home. Fueled by one pound propane bottles, this is the perfect option for tailgaters and campers! Available at a cheap price, considering all the benefits it offers, the Char-Broil Infrared 450 offers 450 square inches of primary cooking and a 150 square-inch warming rack. Three tube burners, fueled by propane, provide optimum temperature control and a 10,000 BTU side burner offers extra space, so you can cook for guests. The durable, porcelain-coated cooking grates are easy to clean. Another convenient feature? This model is push-start, thanks to an electronic ignition button. 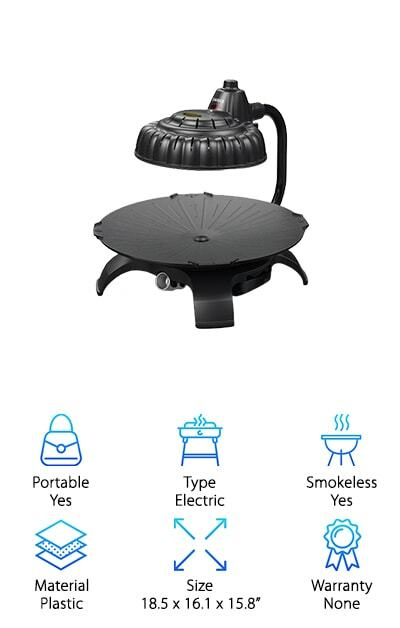 But the best feature is the char broil infrared grill pan, which heats up faster and cooks more evenly than traditional grills. Reaching optimum temperature and keeping food warm is easy, too, due to a fold-down hood. Even the side burner is equipped with a fold-down cover, so you enjoy extra space and prep room when it’s not in use. An excellent addition to your backyard set-up, if you enjoy juicy meat and veggies grilled to perfection, you won’t want to miss this deal! You want the best value infrared grill on the market. This means a durable, and efficient product that cooks your food to perfection. 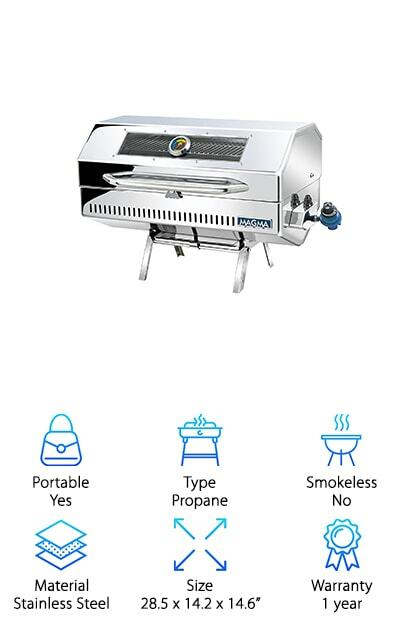 The Napoleon Prestige features an 18,000 BTU rear burner and comes with a heavy duty rotisserie. Featuring optimum heat protection and a sealed lid, you can roast and bake easily. In fact, you can even bake a cake! Talk about versatile! The infrared technology allows you to sear meats to perfection for classic grilling. And here’s the kicker: you can turn this model into a smoker, too, thanks to the Napoleon smoker pipe. All you need to do is fill the tray with soaked wood chips and light the burners. The lid will hold the smoke in, so your food achieves unmistakable flavor. Not interested in gas? Turn it into a charcoal grill via the cast iron charcoal tray. If you’re looking for a model that literally does it all, you’ve found it. We can’t believe all the options offered by the Napoleon, and we can’t think of a better bang for your buck! Our next pick, the Gourmia, could easily be considered both the best portable infrared grill and the best cheap infrared grill. Why do we like it so much? Well, for starters, it offers five different functions, including defrost, barbecue, grill, bake, and reheat. Basically, it has all bases covered in the kitchen. A convenient LCD touchscreen allows you to choose the perfect setting for your meal. Heated by electric Halo Halogen technology, this indoor cooker rotates, while cooking quickly and evenly. Even better, it cooks 50 percent faster than traditional ovens and uses 75 percent less energy! After, clean-up is easy, thanks to the detachable, non-stick grill pan and removable drip tray. And don’t worry about burns. A silicone cool touch edge ensures you and your loved ones stay safe, while your food reaches perfection. Complete with a detachable power cord, this grill runs on a standard 120v connection and boasts a super affordable price. And get this: it comes with a complimentary cookbook full of exciting, new ideas! We searched through all the best infrared grill reviews to bring you a variety of options, and Magma makes our list as one of our favorite heavy-duty, large portable grills. A sleek and attractive stainless steel design, the Magma can go anywhere with you. Perfect for tailgating or backyard fun, it can easily cook for a large, hungry group. Fueled by one pound propane canisters, you can literally set up shop anywhere and start generating delicious burgers, steaks, veggies, and anything else your heart desires. Featuring anti-flare infrared technology to produce flavorful, evenly cooked meat, the Magma emulsifies drippings to give meat a smoky bite. Perfect for searing, slow cooking, and warming, it’s a versatile model that delivers flavors to perfection. The convenient, integrated fold-away legs lock out, so you can cook with confidence and flip those burgers with ease. Show up to the next big game with this awesome grill, sure to be the hit of the party! 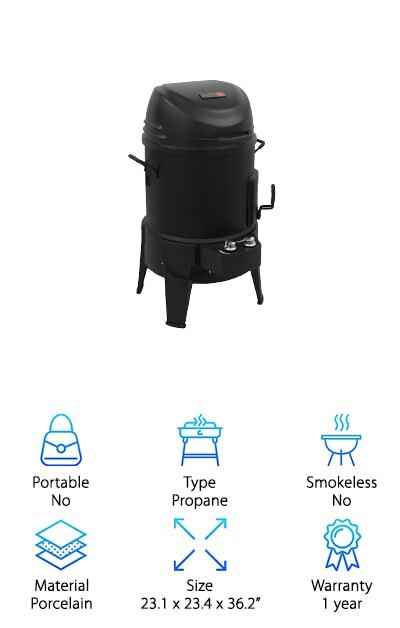 Enjoy a smokeless, open-cooking experience, when you make the ZAIGLE your choice! 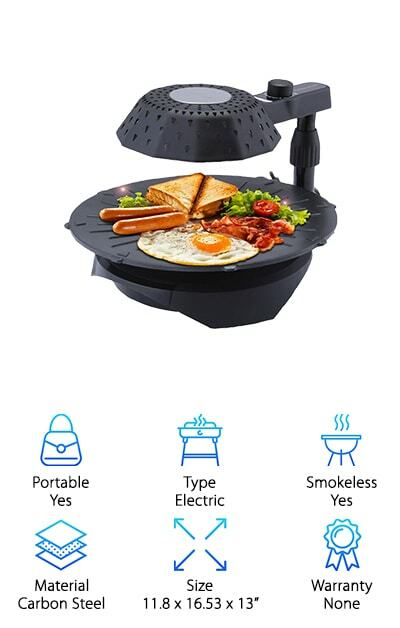 Complete with energy-efficient technology, this model uses infrared rays to grill, bake, fry, and even toast your food! Its versatility and awesome design land it on our list as one of our favorite electric infrared cookers. Turn up the heat with a knob that easily adjusts the infrared rays to the perfect cooking temperature. Five different settings allow you to achieve the meal of your dreams. The grill pan is removable for easy cleaning and does not retain food odors. When you’re looking to add a versatile, interesting new appliance to your kitchen that delivers multi-function cooking, the ZAIGLE is where it’s at. Perfect for preparing all of your favorite meals, you’ll enjoy watching your food cook and serving guests from a great conversation piece! You might be wondering, what’s the best price infrared grill? It all depends on what you’re looking for and the features of each grill. We love the Global King, because it’s fair price comes with a multi-functional infrared design capable of grilling, baking, and frying. The non-stick pan and grease trap make for easy cleaning, while overheat protection keeps you safe from hazardous mishaps. Five levels of power allow you to tailor the temperature to each meal and a timer tips you off when the food’s done! Made from durable Teflon and carbon steel, the Global King is built to last. Its versatile functions make it a great investment because you won’t soon be needing additional appliances. Not only that, it makes an interesting and attractive addition to your kitchen. It’s small size make it easy to store, while not in use, and portable. If you feel like bringing the benefits of a grill to your friend’s kitchen, you can easily pack the Global King up and take it anywhere with access to electricity!